Sadly, I only have one thing to say about this complex. YUCK. And this is coming from a loyal Astros fan. Osceola-County Stadium located in Kissimmee, Florida has horrible concessions, uncomfortable seats, and is the smallest stadium in the Grapefruit League. And I don't expect a new facility any time soon considering that the Astros just spent $250 million on Enron....I mean Astros....I mean Minute Made Field. OCS lacks the personal touch offered by the other small stadiums, and don't even think about sitting in the upper level because you will be on a flat, uncomfortable bench that are murder on your spine. Not too much is good about OCS, but I will give them compliments on their pretzels, the only food I recommend you eat there. Also, hang out on the left field line where the outfield wall opens up to get player autographs. Because the stadium is so small, there are no bad views. 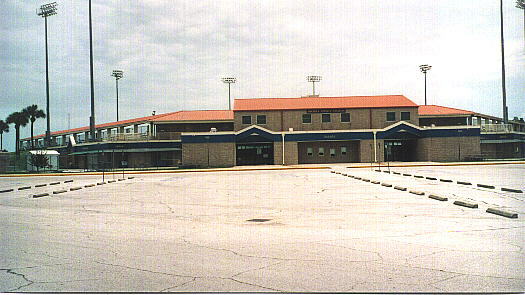 However, if you plan on seeing a game in Kissimmee, I recommend you continue past Osceola County Stadium and keep driving down the road until you hit the Braves' complex: Disney's Wide World of Sports. As far as stadiums go, this is just minor league. Literally. You do not want to go here. Not to much to see at this bland stadium that lacks much personality. Unless you are a loyal fan, keep on driving. Autograph tip: If you go all the way down the left field line to the wall, you will notice there is a large training facility behind it. Fans are not allowed back here, but if you wait by the wall, it opens like a door, and this is where the Astros enter the field. If you cannot get right at the wall, do not worry. Anywhere along the left field line will be fine.